The New York National Boat Show is open from 10 am until 9 pm Saturday (Jan 22, 2011), and from 10 to 6 on Sunday at the Javits Center. Sunday is probably your best bet to avoid the crowds. It's $12 to get in. The boat show website advertises a "free shuttle from Grand Central Station", but don't hold your breath. We ended up taking a 10 minute, $7.50 cab ride from Grand Central to Javits. Exhibits are spread among two huge expo areas in the Javits Center... One section is filled with large boats and yachts, many between 30 and 50 feet long. 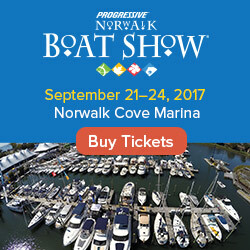 This is where you'll find most of the big boat brands, including huge displays from Sea Ray and Cobalt among others. The other section also has several boat displays, including many wakeboard boats, jet skis, and fishing boats. But it also includes several aisles of interesting marine products and services. This is the area where you'll find the crew from Deadliest Catch, and see innovative products such as Autotether and many other things that will make you wonder how you boated without them for all these years! This is also home to the marine electronics companies. 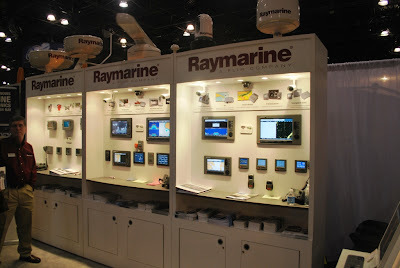 If you are the type of boater that reads Panbo regularly, you are going to want to allow yourself extra time here to check out all the gadgets on display from FLIR/Raymarine, Simrad, Lowrance and the like. If you go to the NY Boat Show this weekend, please comment below and let us know what you thought of the show this year. Your pictures from the show are also welcome on our Facebook page. Come see us next weekend in Connecticut. 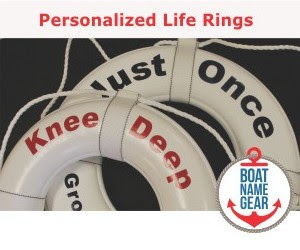 We'll be exhibiting at the BoatNameGear booth and giving away free stuff to DailyBoater readers.